I absolutely loved the Gratz book I got at last BEA, so his new one was the first on my list this year. I had high expectations, so I saved it so that I could savor it as I read. I love the unique perspectives he uses with his historical fiction. I received this ARC from the publisher in exchange for an honest review. This story is told through dual perspectives, one is a young Japanese teen and the other is a young American soldier. The book takes place during World War II and is set in Japan and discusses the American invasion of the Japanese islands. Okinawa has its own culture and languages, but after being overtaken by the Japanese, young Hideki and his friends and family must give up their traditions to accept the Japanese ones. Hideki doesn’t want to fight. In fact, it common knowledge in his family that the first born son is exceptionally cowardly. However, that doesn’t stop the Japanese and his school from him training him to become a soldier in World War II. Hideki has lost track of all his family members and the only thing he has left is the grenades and weapons the school has given him. 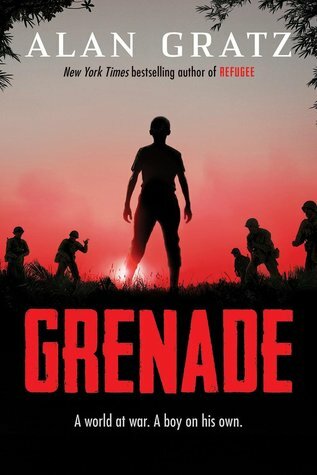 When the Americans near Okinawa and begin attacking these children, Hideki is forced to face the fact that nothing could have prepared him or his classmates for the treachery of war. Ray is a young American soldier, who was desperate to leave home. The only way this was possible was by becoming a soldier in the war. Ray doesn’t want to kill anyone and the battle on Okinawa is the first time he has seen any real action. Ray is forced to make tough choices, when it becomes uncertain who is a threat and who is caught in the crossfire. The war means something different to everyone and no one wants to lose anyone as a result of it. I thought this novel moved slower than Refugee, but it was an interesting perspective. It didn’t place Americans or the Japanese as heroes. It talked about the people who don’t have options that get lost in the crossfire. Even though they may become soldiers, it may have been the only thing that could do. It is a sad exploration of war, but it is done in a real way. It totally reminded me of that movie Hacksaw Ridge.